A potentially damaging investigative report in the latest issue of Summit magazine published by the British Mountaineering Council has drawn attention to insurance scams for helicopter rescue of trekkers in Nepal. Written by climber-journalist, Ed Douglas, the article goes into gory details of trekking agents and their clients frauding insurance companies, overcharging for genuine rescues, and even getting insurance companies to pay for a ‘fast ride’ back to Kathmandu when they get bored by forging health certificates to show they were sick enough to need evacuation. As the number of helicopter companies in Nepal proliferates, there is cut-throat competition among them to get a larger market share. The performance of helicopters have also improved and it is now possible to pluck climbers off mountains at altitudes of 7,000m as happened on Annapurna in 2010 when an Ecureuil B3 helicopter rescued three climbers. 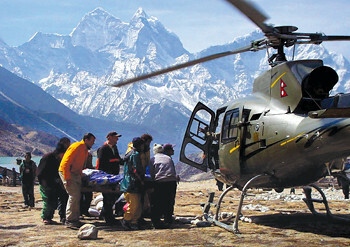 More than helicopter companies, the article quotes insiders as saying that it is the travel and trekking agents and private hospitals who make money out of the estimated 1,500 helicopter rescues in Nepal every year. Nepal is the second most expensive after the United States for a helicopter rescue, it is even more costly than getting rescued in Antarctica or Switzerland. As insurance companies get scammed, they raise the premium and this is passed down to genuinely sick people. A doctor in Kathmandu is quoted in the article as saying that only 20 per cent of patients medevaced to Kathmandu for acute mountain sickness actually needed it. Trekkers persuaded they need treatment when they don’t. Hospitals and helicopter companies are sometimes in cahoots. Trekkers who get bored, can buy fake documents and forged certificates to prove they needed to be choppered out. An insurance-covered rescue flight often flies in cargo from Kathmandu, and extra seats on the flight are sold for cash on the spot. Two trekkers were evacuated from Manaslu on the same rescue flight, the local agent billed the insurance company $5,000 for two evacuations. Having fake doctors’ certificates ready for trek members to claim insurance for being helicoptered out so they don’t have to walk back down the same valley. Who says Nepal is a poor country? We are awash in cash. "We don’t think the Maoists are willing to stop when people think they will." Nepals domestic airlines are lining up fortake-off with a whole new array of aircraft, new routes and more frequency.